GALVESTON, Texas Marine archaeologists are excited about the discovery of what may be a well-preserved 200-year-old shipwreck more than three-quarters of a mile below the Gulf of Mexico. Researchers led by a team from Texas State University in San Marcos are calling it the deepest shipwreck  4,363 feet down  that archaeologists have systematically investigated in the Gulf of Mexico and in North America. The remains some 170 miles southeast of Galveston are "tantalizing," researchers say, because of the degree of preservation. Undersea images show an outline of an 84-foot-long, 26-foot-wide wooden hull and copper-clad sailing vessel, possibly with two masts. "This site has such an amazing rate of preservation that these artifacts are in astoundingly wonderful condition and they truly provide a physical connection with our shared past," said principal investigator Fritz Hanselmann, of the Texas State University Meadows Center for Water and the Environment. But the wreck is so deep that divers can't explore it. So, this week, researchers have used remote-controlled undersea vehicles to examine the remains and recover items with its robot-like arms  things such as ceramics, liquor bottles and an octant, a navigational tool. Other items spotted among the wreckage are muskets, swords, cannons and clothing. CBS affiliate KHOU reports that the robotic arms also retrieved a sealed bottle filled with bright yellow ginger, which was used as a treatment for seasickness. Hanselmann anticipated the artifacts will help answer questions about the vessel's age, function and cultural affiliation. "Not only do we learn more about the ship itself, but we are able to understand more about the crew, their activities and the bigger picture of maritime activity in the Gulf of Mexico region," he said. A Shell Oil Co. survey crew notified federal Interior Department officials in 2011 that its sonar had detected something resembling a shipwreck. A year later, a National Oceanic and Atmospheric Administration vessel examining seafloor habitat and naturally occurring gas seepage used a remote-controlled vehicle to briefly look at the wreck. Besides determining the dimensions, the examination showed it to be undisturbed and likely an early 19th century watercraft. Still unidentified, it's been dubbed the "Monterrey Shipwreck," adopting the name Shell Oil had proposed for its development site. Federal agencies and the Texas Historical Commission also are involved in the project. It's the latest in a series of historical shipwrecks examined in recent years in the Gulf of Mexico. In 1995, after a more than decade-long hunt, Texas Historical Commission archaeologists found one of famed French explorer La Salle's vessels in a coastal bay between Galveston and Corpus Christi. The remains of the LaBelle, which went down in a storm in 1686, have been recovered and are undergoing an unusual freeze-drying treatment at Texas A&M University. The ship is to be reconstructed next year and become a centerpiece of the Bob Bullock Texas State History Museum in Austin. 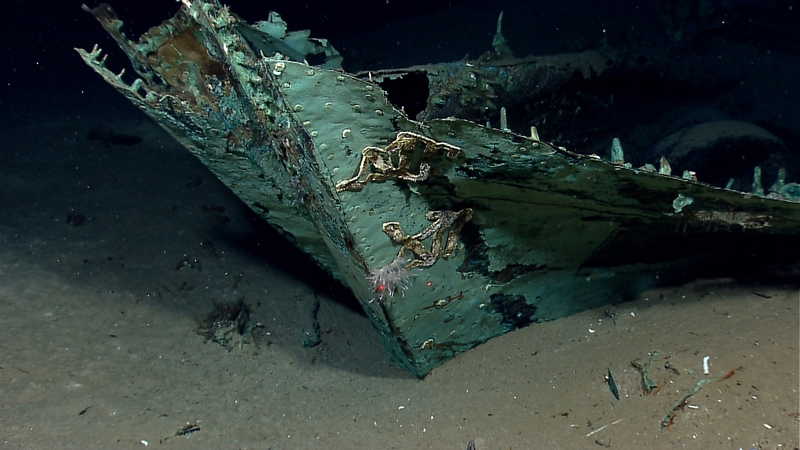 Earlier this year, researchers about 20 miles off the Galveston coast used special 3-D imagery to map the remains of the USS Hatteras, the only U.S. Navy ship sunk in the Gulf of Mexico in combat during the Civil War. The 210-foot iron-hulled ship went down in 1863 is in 57 feet of water during a confrontation with a Confederate raider. It's believed storms in recent years have shifted the sands on the sea floor, exposing the wreckage.